I went back to the US a few months ago and had the opportunity to engage in one of my favorite aspects of international living, which is to take a look at certain things people (including myself) take for granted as they go about their daily lives in their respective countries. I’d say that in any given country, there are certain things that people do as a society – usually without thinking consciously about them so much – which work really well. Then there are things that they do which really don’t work so well, but they do them anyway. Mostly because from their perspective, that’s just how things are and even if it’s annoying, that’s life. So I’d like to spend a few photos and paragraphs today looking at three institutions that I see in the US which I highly admire. Institutions we have the fortune to take for granted in the US as always being there, which may not be the case in many other parts of the world. 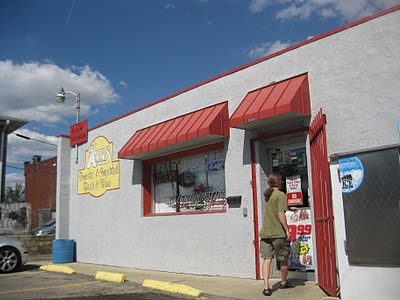 The carryout you see here is in Columbus, OH and was never more than a short trip from any of the several apartments I lived in there. Inside, you can find dozens of high quality imported and domestic beer and wine. There are dozens of other locally owned carryout stores like this one throughout the city, and a comparable number of local bars with plenty of good beer on tap. There are so many of both in a college area like this one that an easy-going college kid has no reason to ever doubt in the reassuring ubiquity of some tasty imbibe. Many people don’t know that we owe today’s deluge of microbrew varieties to Jimmy Carter and the Congress of his time. In 1978 an amendment was added to a federal tax bill that permitted the making of beer and wine at home with no need for registration or taxation. When Carter signed that bill, a time-honored industry of American craft beer was revived in the US. What had been a web of costly legal overhead costs which all but prohibited amateur brewing became a wide open opportunity for anyone to try it out with very little investment. Many of those amateur brewers, once satisfied with their unique and delicious creations, decided to go professional after all. 30 years later, we can enjoy the many fruits of their labor. Today, we are enjoying a renaissance in craft brewing made possible by that small detail in a tax bill. It’s ironic that’s all it took to bring it back, considering the veritable golden age of brewing in the US was cut short by a full-out 18th Amendment to the Constitution in 1919, known popularly as Prohibition. Looking at Columbus again as an example, today there is still a part of town known as the Brewery District, which prior to Prohibition had been the home to five local brewing companies begun by German immigrants. Before the waves of German immigration and the widespread national embrace of their brewing styles, Columbus and the rest of the US had been drinking English-style ales. Personally, those are my favorite. Today’s blending of American barley and hop varieties with traditional English ale styles is as good as it gets. In Ecuador, in comparison, there is a woeful dearth in beer options. Ecuadorians love beer, especially their Pilsener querida. Right on the label of the iconic 22 ounce Pilsener bottle (meant for sharing), it says ecuatorianamente refrescante, paying homage simultaneously to national pride and the beer’s refreshing quality on a hot day. I’ll admit, especially when it’s nice and sunny, or if I’m eating seafood, I do enjoy a Pilsener. But there are few other beers around to be had, and those that do exist closely mimic that same commercial, light lager style that you can find repeatedly from any given country throughout the world. Red Stripe, Corona, Budweiser, Molson, Foster’s or Tsingtao, every country’s got at least one. Don’t get me wrong, that style is fine for the right occasion, but some other options would be very much welcome. Needless to say, after two years straight of largely doing without, during our trip I made a point to sample many different styles from different parts of the country. From 2nd St. Brewery to Marble in Santa Fe, from Rogue in Oregon to Red Tail in California. Goose Island from Chicago, Great Lakes from Cleveland. And bigger names like Fat Tire and Sierra Nevada. I thought they were hops when I saw them, and some comparisons with photos of the real thing prove (as far as I can tell) that these are, indeed, hops. So what were they doing growing out in the wild? Seeing as how hops are not native to North America, I can do no more than speculate that the area I was in might once have been planted with hops in order to supply breweries, and now their progeny stand in silent tribute to the days of brewing past. 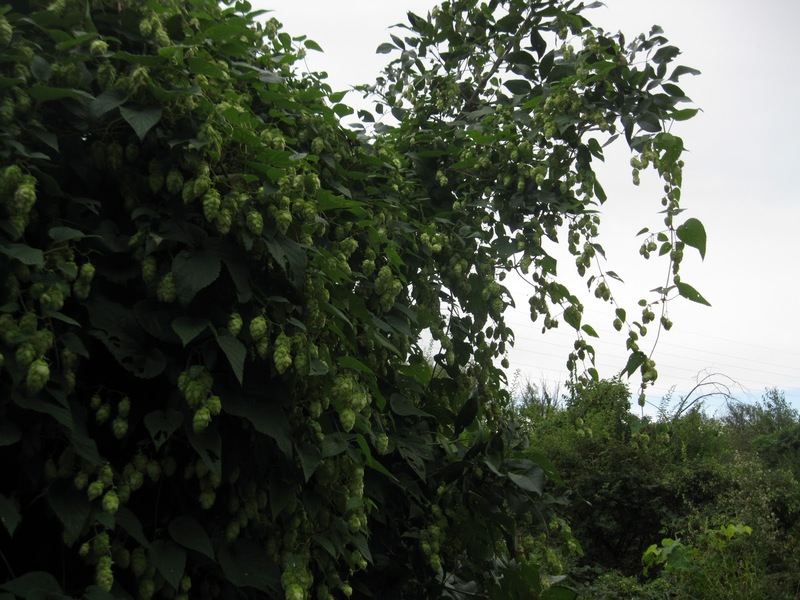 Whatever the case is, someday, if I’m living in the States again, I’ll go to that place, cut me a viable switch from those vines and perhaps revive a strain of hops forgotten by the ages. One thing I will say in defense of Ecuador’s brewing industry is that it still operates under the very pragmatic system of the bottle deposit. The deposit here is 25 cents a bottle, quite high compared to the 10 cents that Michigan requires, especially when you consider the difference in cost of living. Let’s say you have empty bottles in your house. You go down to the store with your empties and exchange them for full ones, and that way you don’t pay the deposit. Each store, in turn, has cases of empties that they swap out for full ones with the distributor. Easy, simple, and it prevents waste. Most conspicuously within the city, where you don’t see broken glass all over the place as you often do in the US. The thick bottles look a little roughed up on the outside from going through the bottling process over and over, but they’re fresh on the inside! Our second consideration for today is the parks system. There were a number of things that I was looking forward to as I anticipated our trip to the US, and one of them was a walk in Glen Helen. Located just outside of Yellow Springs, Ohio, it’s technically part of Antioch University. In high school and college, I spent countless days and nights wandering around that place with various friends or by myself, often bearing witness to things no less than magical. The quintessential trail through the green forest for me will always represent the simple joy of being alive and in nature. I’m endlessly thankful that there are places which are left to be forest in a world full of cities and planted fields. 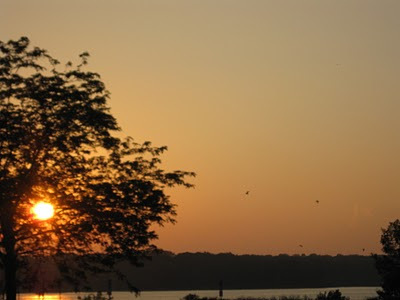 Surrounding this reservoir outside of my hometown is forest, a disc golf course, and a meadow of wild flowers and grasses designed to recreate and preserve the wild meadows that once blanketed the extensive wetlands now drained and given over to cornfields throughout much of the State of Ohio. Parks are also grounds for historical reenactments, such as the Fair at New Boston, which I hadn’t visited since I was a kid. This Fair recreates the time of the early independence and expansion of the United States beyond Ohio and the Great Lakes. 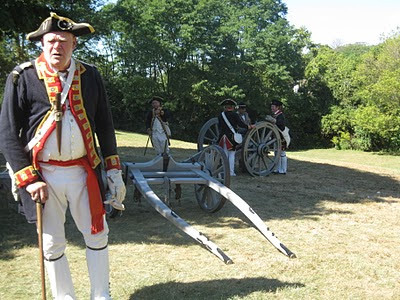 My interest in history only grows as I get older, and this reenactment was an enjoyable way to spend a day at one of the many green spaces outside of my home town. 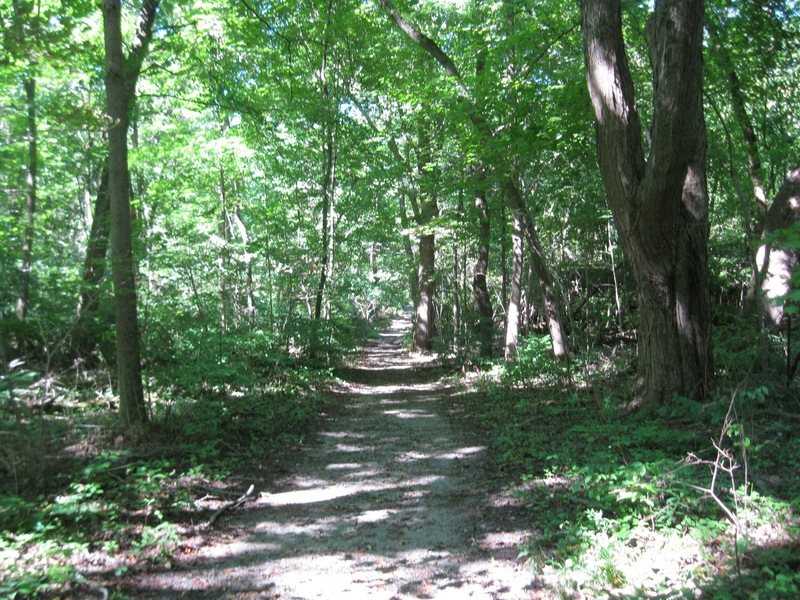 It’s a small, slender sliver of green space running along a ravine through Columbus. It runs past the nicest of the many apartments I lived in during my college days, and was the setting for some laid back Sundays and fun parties for a couple of years. I imagine it still is, for the people living there today. I was happy to see that the massive slice of tree trunk I had rolled up onto my front porch and called a table was still where I had left it. I was also happy to see that some permanent garbage cans had been placed throughout the park, as litter was a serious problem in the park when I lived there. Which was inevitable, since there were places to sit and eat, but nowhere to discard your waste back then. Once I had even gone around town and taken some public garbage cans from areas of town which I thought had enough already, and planted them in the park. I called that Robin Hood tactic “urban osmosis.” For a few months, someone even came periodically and collected the garbage from those cans, but then one day the cans were gone. The day we visited, the sky was blue, the grass was green and the park was clean. Still a fantastic place to spend an afternoon. My last praise of the day is for our libraries, universities and other educational institutions. I have great respect for our libraries. They are an easy thing to overlook, and lots of people don’t really use them very much. I went with my mom to the library all the time when I was a kid, both in my hometown and in Crestline, where her parents lived. 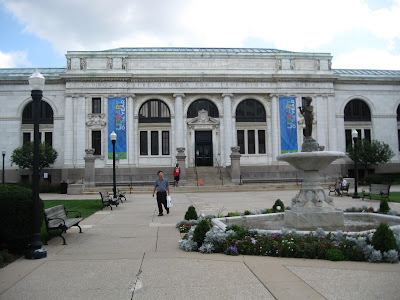 When I moved to Columbus, I discovered the extensive public library there, and the many modern services it offers. Music, movies, and an advanced system of requests and holds allowed me to find just about any book, album, film or TV series I could think of and have it delivered to the library branch in my neighborhood, for free. I even received an email message telling me my request was ready to pick up. US citizens enjoy countless privileges, but our virtually unlimited access to knowledge and culture via libraries is perhaps one of the greatest among them. We spent an afternoon exploring Ohio State. I lived for seven years in the campus area, and now it’s been about eight years since I moved away from there. 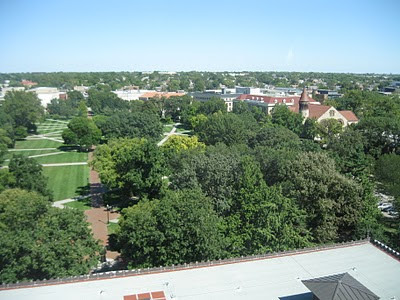 The campus area and its surroundings have changed a lot since then, seeing the construction of many new buildings and facilities, and the revival of some classic ones. One great improvement to the library is the 11th floor. I used to go up there during long breaks between classes, as it was always quiet and offered views like the one you see here. But at the time it was a functional floor of the library, full of flickering fluorescent lights and dusty stacks of books, with a utilitarian desk situated in each window well. We rode the elevator to the top floor during our visit, me with the intention to show Nancy the view. Little did I know that this level had been remodeled into very comfortable observation deck, complete with wireless internet, overstuffed chairs and couches, good lighting, wooden floors, and big desks for studying, providing an excellent space for the appreciation of the panoramic views of the campus. This change echoes many of the tasteful changes made around the area, in my opinion. The new buildings do their best to look modern and blend in with the older structures around them at the same time. Attention has been given to outdoor space and pedestrian traffic, as well as to the “live-work” concept that has needed to be reinvented in the US after decades of overly assertive zoning codes. There is also room for local business rather than strip mall after strip mall of parking lots and big box franchises. Those parts of town certainly exist and continue to expand in their sprawling way, but the new growth in the more central parts of town reflect a paradigm shift in urban planning that I hope can take root throughout the country. In short, Columbus has seen some tasteful improvements in the past several years, and has remained one of those cities I consider to be a nice place to live. Another place I always enjoy visiting in Columbus is the Franklin Park Conservatory. Located in the middle of a big city park, itself in the middle of one of the more stately of Columbus’ older neighborhoods, it is a gigantic greenhouse and a sort of zoo for plants. While one can feel sorry for animals stuck in a cage or artificial habitat, as long as a plant gets its requisite amount of light, heat and nutrition from its soil and what have you, it will be content to be where it is. Hence this conservatory makes for a happier place for a gardener and animal lover like myself to visit. 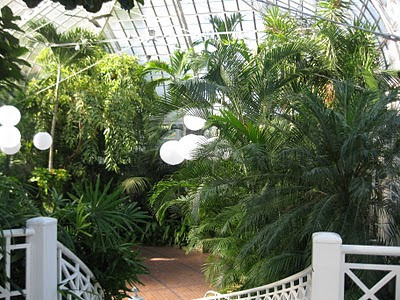 The conservatory is divided into several habitats, including a desert, a jungle and the Pacific Islands. It also has a great palm tree house which reminded me quite a bit of the outdoor gardens along the river in Guayaquil. There’s a bonzai exhibit which features a little tree much older than the US Constitution, and a current outdoor exhibit of carnivorous little pitcher plants. A truly remarkable place for kids and grownups, if you’ve never been. Ohio, like much of the United States, is blessed with nice parks and educational places. They often operate in conjunction, such as this Conservatory in Franklin Park, or Glen Helen and Antioch University. That seems right, as education leads us naturally to a place of peace and quiet, and it is peace and quiet that provokes a thoughtful state of mind. I hope you’ll think of such things as you go to the polls in November, for example. While omnibus spending packages often go without a popular vote, parks and schools always seem up against budgets hinged upon the public whim. Maybe you have kids in school or maybe you don’t. Maybe you use the parks and libraries, or not. Either way, there is something very important about knowing that they’re there, and that they define our country in a remarkable fashion. 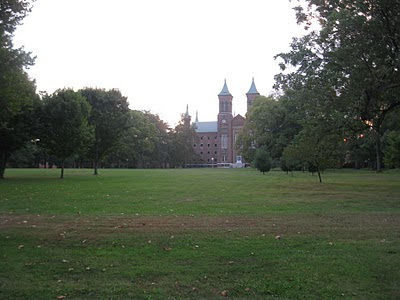 I hope I can take my grandchildren to Glen Helen, to the statue of Horace Mann in the tall grass, and then take a walk in a manicured field in front of this beautiful Antioch building with them, full of the enthusiastic young and old. Cher: Young or Old, You’ve Still Got Me Babe!